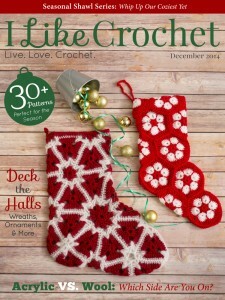 Bring Christmas to every inch of your home. 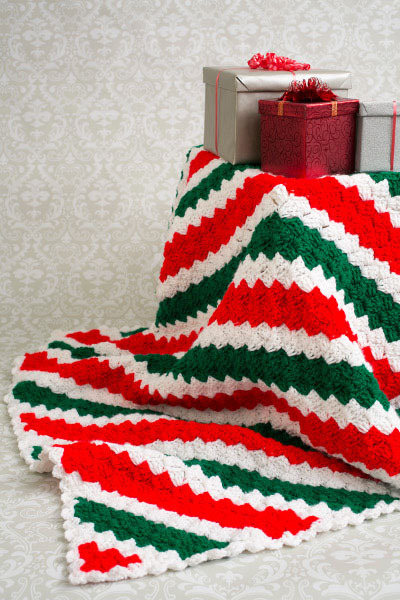 This bright and festive throw will add the extra holiday cheer you need this Christmas. Beginning Block: (ch 6, dc in 4th ch from hook and in each of next 2 chs). Block: (ch 3, 3 dcs) in space as indicated. Shell: (slip stitch, ch 3, 2 dcs) in space or stitch as indicated. Rows 6-50: Continue increasing 1 block on each row alternating colors: 3 rows green, 2 rows white, 3 rows red, 2 rows white until there are 50 blocks across. Rows 53-59: Alternating colors continue pattern as for Rows 51 and 52 having 50 blocks in each row. 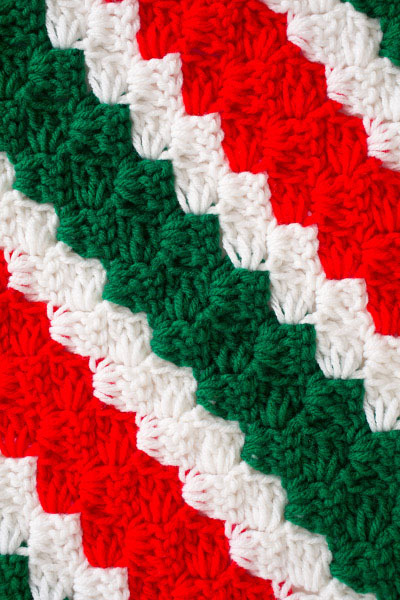 Rows 62-108: Continue this pattern alternating colors as established until 1 block remains and fasten off. With white work along top edge Shell in first right corner dc, [Shell in center dc of next 3 dcs, Shell in next dc] across. Work along left side edge [Shell in center dc of next 3 dcs, Shell in next dc] across. Work along bottom edge [Shell in dc, Shell in ch of center dc of next 3 dcs] across. Work along right side edge [Shell in dc, Shell in ch of center dc of next 3 dcs] across, join to beginning slip stitch and fasten off. Thank you very much, this pattern very beautiful, I like it! This is very pretty. Thank you so much. The patter is lovely. I am going to start it tonight. That is very pretty, thank you!